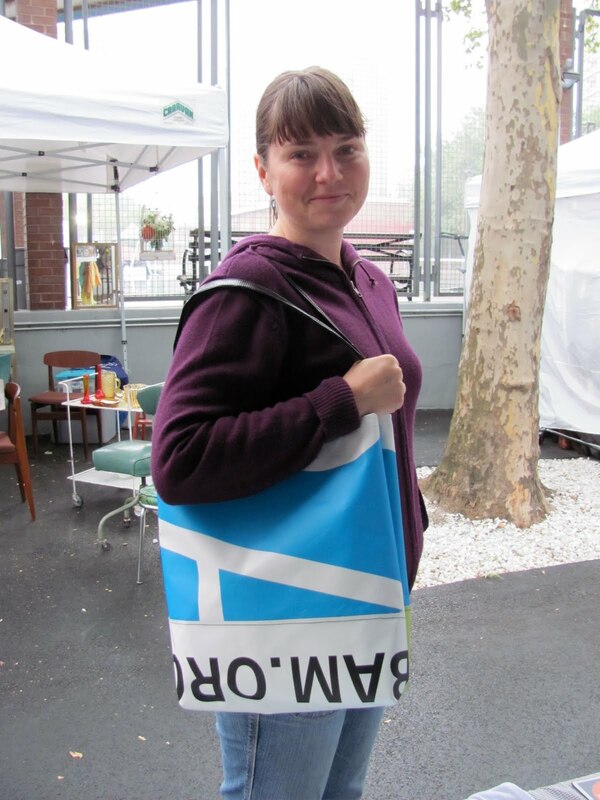 I met a woman at Smith Street Fun Day a couple months back and she saw my billboard bags. She told me she worked at the Brooklyn Academy of Music and had some extra billboard vinyl that she had collected from working there. She said she always wanted to do something with it and didn't know what. She liked my bags and asked if I might be interested in making some bags out of them. I thought this was a stellar idea and told her I was in. This fabric was soooo much harder than the vinyl that I have been working with. I used my own straps and added some pockets like I do with my bags. The color of her vinyl was super bright and fun to work with. I made two bags and three wine totes. Luckily they came out great and she loved them!